Skills and Ideas Taught: Awareness, detection and elimination of cyber security threats and vulnerabilities. Primary Audience: US Government employees, Corporate employees, College Students. Assessment Approach: Time-stamped behavioral data captured during game play, analyzed against pre-determined indicators. Each training objective has its own detailed evaluation, as well as general profiling of the user’s focus, attention and interest. Description:Cyber Crime is an ever-evolving threat. Developing skills in identifying and detecting tell-tale signs of breaches help individuals to respond in adaptive ways. 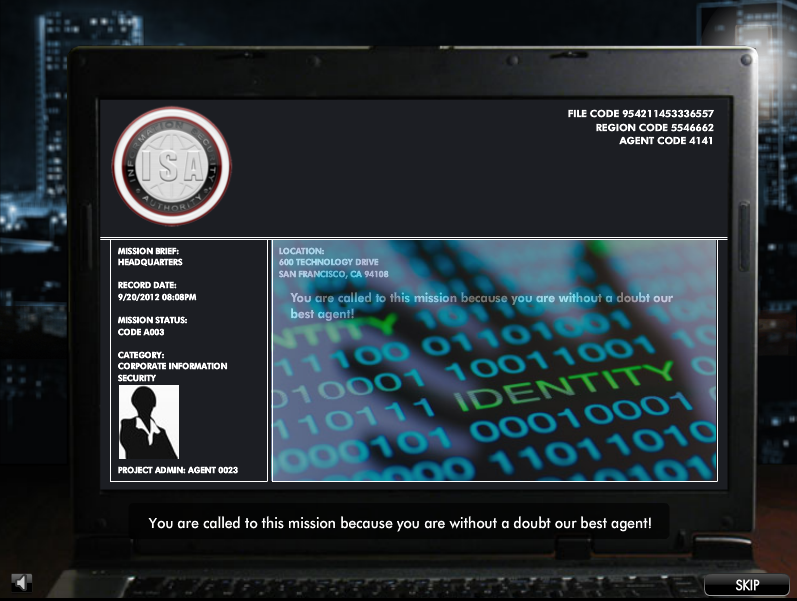 Agent Surefire: Insider Threat places the trainee in the position of a skilled inspector in a real-world cyber breach scenario happening in near-real-time. Common threat vectors are mapped to the training objectives while more advanced threat vectors are laced into the scenario, providing a dynamic environment for engaged decision making and hands-on experience. Applied gaming theory and neuroscience of learning provide immersion, repetition, emotional responses and develop critical thinking. Operating System: Web-based and LMS deployment.